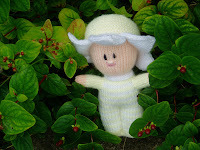 New pattern in my Etsy shop. I've been working on the flower baby for the last few days. Smem didn't seem to appreciate the work, she just wanted to eat her. Stupid google won't upload any of my pictures this evening. Boo! So can't show you the coat I made for Molly from a really old knitting pattern I have. It's on flickr though (hope the link is right). Made that on Thursday. So much has happened since the last blog, besides making coats. Was pretty depressed when I got up this morning. Had set myself up last night, after updating the blog, to finally get to work writing a quilt pattern so I could send it on to Sherry and get some feedback. Its a daunting thing as I've never written one before. I tend not to even follow them! Of course as soon as I got sorted Smem woke up and took about an hour and a half to go back to sleep. I ended up giving up on trying to do anything and went to bed once I had her sorted. She then woke around 1am and 2am so I was pretty tired when I got up this morning. Then to add to my woes she got sick everywhere after her breakfast (second day in a row. I'm wondering if its her rice?) and managed to hold on to some of her food so that she could be sick again after I had changed her. We very nearly had tears! 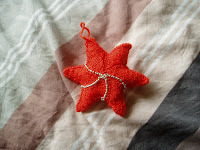 When she eventually went down for a nap I sat on our bed sewing beads onto the star that I made last night. Smem had her first taste of carrot today. Took a while to get started but she horsed it down once she got into it. Has led to everything been stained orange though! Finished the rooster potholders today - finally! I'm quite proud of them. I don't have the patience for satin stitch applique so I did buttonhole stitch instead. So much faster. On other news, sold another two patterns today on Etsy. Woo Hoo!! I am on fire! Woo Hoo !!!!!!!!! Had my first real Etsy sale today (i.e. not an alchemy sale). 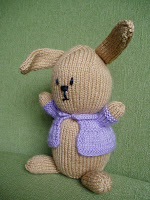 Made this bunny over the last two days for Emily. Posted the pattern on Etsy and it sold immediately. Have a few put on now in case it turns out to be popular. Witty Knitters tonight. Am making something for my sister for Christmas so will be doing that. Crafting has been a bit slow at the moment. Emily is cutting through her first tooth so she needs lots of attention during the day. 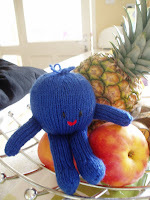 Managed to finish the pattern for Billy Blueberry. It is now for sale in my Etsy shop. The pot holders for Roisin's house-warming are nearly knitted. I plan to do the quilting this weekend to get them finished. Bought wool today in Springwools to knit pressies for Katie and Roisin for Christmas. Need to start early as it will probably take ages. Just need to get down to work on the quilt designs now and start sending some through to Sherry. Can't be a designer if I never put any ideas down on paper! The seahorse is finished. Its quite nice. Pity that you have to be up close to see the detail in the colour. And it would benefit from some sparkle. Now on to 'designing'. Can only do work in the evenings though as Emily is teething real bad and not really sleeping during the day. Poor thing! One tooth is nearly through now. The rain yesterday was ridiculous. 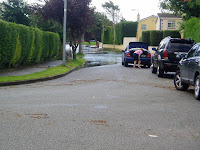 One half of our estate was flooded. There were people out in boats today. Luckily we are in the half that didn't flood. Thank God! I think Charlie would have lost the plot if our house had flooded as he's nearly finished doing up the house. It would have been awful to have to start all over again. On other news, today was Emily's second time to taste baby rice and she ate it all up. Hepled by the fact that she could see her daddy eating from a bowl at the same time. She had a second bowl at lunch-time. 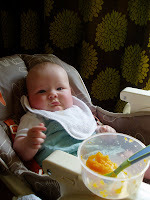 Fair enough, the bowls are only 1 spoon of rice to 10 of formula milk but its still really good going. 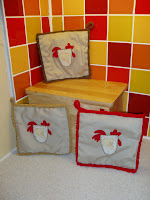 On the crafting front, I have been in contact with Sherry who is starting up an irish quilting magazine. She's looking for designers and people to make up quilt patterns. Hopefully I can make up some cool patterns as it would be cool to be published. Imagine, being called a designer! Now that I am back on my knitting buzz I decided to start to make patterns of my own. All these years knitting and I've never put my own ideas into practice. 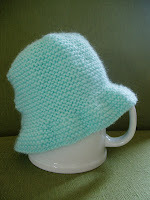 So the first instalment is a simple baby hat with a skinny brim. I thought I was making a 3-6 month size that would fit Smem but I got my figures wrong. So this is a 0-3 month size, kindly modelled by a giant mug I have. 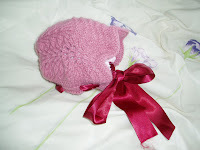 Pictures of a bigger size modelled on Smem will follow as soon as I have made another hat. Basic pattern is 0-3 month size. Figures in brackets for 3-6 and 6-9 months. Cast on 107 (120, 132) sts. Brim Shaping Row: K1 (0,0), [(K1, K2tog)] to end. 72 (80,88) sts. Finished the second bonnet today. So cute! 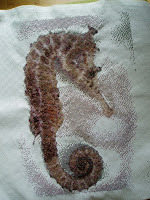 The seahorse is on hold until I get more thread. So that has given me a chance to start on some knitting projects from Ravelry. One of the ladies in the choir had twins two weeks ago so I decided to knit some baby bonnets. 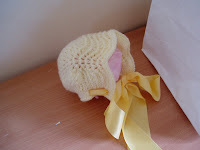 This is the 'First Love Baby Bonnet', which is also available at http://www.yayknitting.com/. It's so cute and super quick to make. I made the yellow one last night while watching telly. Now I am making a pink one for twin no.2. This hat is too small for Emily - well she is massive. However, I spent most of last night in bed just thinking up of patterns that I could make myself so cute hats. Can't wait to finish this hat and then get designing.Woo Hoo! 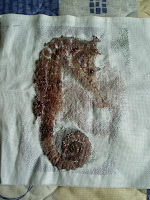 Well the seahorse is not coming along too bad now. Its quite nice really. There are some lovely blends of colours in it, but you can only see them when you are up close.